That's what they tell me, anyway. I've only ever been to front alleys. 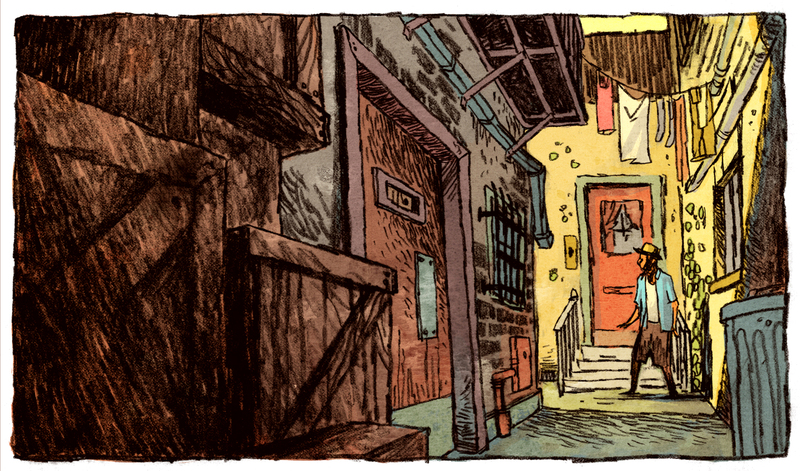 I drew another alley before this, and it was not as good. Then I drew this one so you wouldn't have to look at it. You're welcome. By the way, I made some moving pictures with my brother and some friends. Four and a half minutes of moving pictures. It was fun. My talented friend Tyler and his devoted army of talented associates made a movie, too. I like back alleys, especially when they are filled with clutter. Nice lines. Loves me some moving pictures. Ps, this alley is way better than whatever you didn't post. I have faith. Moving pictures!? You're from the future!? Really nice work Jake. It looks so effortless but everything in it has a purpose. Based on the background concepts, I'm excited to see these "moving pictures" you speak of. I'll postpone stealing your time machine 'til then.